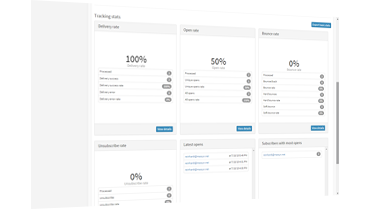 wMail is a feature rich, affordable bulk mailing system. E-mail based marketing, or bulk mailing is now the most cost effective and has the highest success rate than any other form of marketing. Bulk mailing is a form of direct marketing, where the client receives your newsletter, or any type of e-mail delivered directly to them, opposed from interruption marketing such as radio or television. The wMail system is a web based application, empowering you to access your marketing system from anywhere, anytime. wMail comes with a range of free templates available for your immediate use, but our dedicated team of designers are on standby to assist you with a custom branded template. 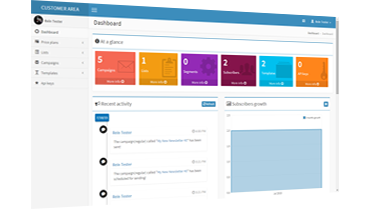 The dashboard gives you an informative glance of all your campaigns and lists. Manage, import, export and split your e-mail lists with ease. Track each campaigns statistics individually. wMail comes with a range of free templates. Signup for a subscription to receive a rebate, or purchase a pay as you go topup. Each contract subscriber receives 1 free customized template. Future date the sending on any campaign. Personalize each e-mail through your extensive subscriber database. Send HTML or Text Based E-Mails. Send an attachment with your campaign.